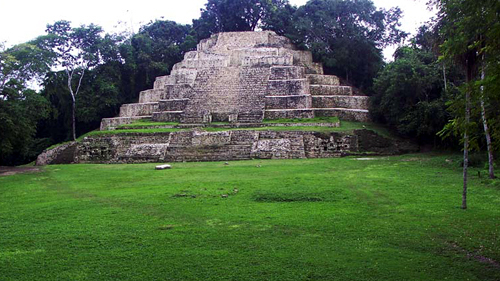 Lamanai Mayan ruin is Belize’s longest continuously inhabited site; pollen evidence places first habitation around 1500 BC. Located on the shore of the New River lagoon, Lamanai is upstream from Cerros ruin, and the two cities traded extensively. Submerged Crocodile is the ancient Mayan name of the site; the name was recorded by two Spanish priests. The city occupies 950 acres and 700+ structures have been mapped, but only 70 have been excavated. Many tombs have been discovered during excavation, and the “Temple of the Jaguar” has two jaguar masks flanking the stairway. This ruin is most easily accessed by a boat ride up the New River, through a bird reserve. The birding is a fantastic addition to a wonderful day spent at this site. This tour is a no-brainer if you are flying in one day early for our island package. They pick up at all Belize City hotels . A 1.5 hour bus ride takes you to the river where you are transferred into fast river cruisers that boat upstream about an hour to the ruins, stopping often to view the exotic wildlife along the river banks. On one trip our fantastic guide pointed out about 15 different tropical birds including: green-backed herons, olivaceous cormorants, jabiru stork, northern jacana, and purple gallinules. Crocodiles and blooming water lilies are also profuse. Arriving at the ruins, lunch is served and the tour that follows includes excellent interpretation. The tour is about $120/person and can be booked at the Biltmore desk upon arrival, contact them directly for more info: guestservices@belizebiltmore.com. What to bring: binoculars (a must! ), money for the gift shop, rain and warm gear (the boat ride is cold, and if it rains you’ll get wet too), bug spray, your iPod for the boat ride (the engine is noisy). This is a fantastic tour, don’t miss it. For more information on other things to do in Belize, visit our webpage.